 USA  2014  100m   Directed by: John Klein.  Starring: Sara Gorsky, Cole Simon, Tanya Thai McBride, Clayton Stamper, Kate Black-Spence, Nick Cardiff, Jesse Gentry, Mark Soloff, Mike Molenda, Moira Begale, Matt Bendickson, Carole Bernas, Gregory Bernas.  Music by: Darren Callahan. After a screening of Chrysalis, a friend asked me if I liked the horror film genre. That question sparked the perfect place to begin this review, because I've never been a genre-specific film-goer. Generally speaking, though, I don't like modern horror films and tend to avoid them because they're predictable, lack characterization, and celebrate gore more than good writing. My favorite horror films are slower paced. They don't need gore to tell me that something is horrific. Tension is more important than spectacle. Written by Ben Kurstin and directed by John Klein, the story centers almost exclusively on three characters, Josh (Cole Simon) and Penelope (Sara Gorsky), who are partners, and Abira (Tanya Thai McBride), whom they meet toward the beginning of the film, who promises to lead them to a settlement of people, i.e., relative safety. They are survivors in a post- apocalyptic world who have known nothing but the search for food and shelter. Murderous, zombie-like cannibals roam the landscape and are a constant threat. One of the delights of the plot is the way it unfolds its internal history organically through the characters as they proceed, so I won't spoil the details here. 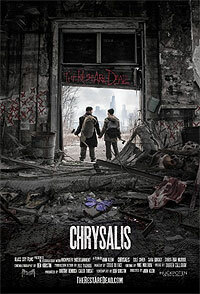 Chrysalis is remarkable in that it stridently avoids the pitfalls of its genre. It is primarily a character study in a survival setting. In this way, it reminded me less of a zombie movie and more of The Grey, in which a pack of wolves pursue a band of plane crash survivors. What the threat is specifically isn't as important as its presence, its driving force, its relentlessness. But, since it will be classified as a "zombie movie," it's refreshing to report that the cannibals in Chrysalis aren't monsters; they're human. Their humanity and loss of it haunts the main characters. This is how zombie-type characters are used best, when they force us to examine what makes us human. The the sense of dread is established early in the film, and the story maintains it throughout, growing it, nurturing it, so that the moments of action become cathartic payoffs. As Hitchcock would say, tension comes from wondering what's around the next corner, not seeing what's there. This let me care about these characters and what happens to them. Impressively, the action has consequences when it does come, which is unheard of in most horror films. These people are repulsed by the violence surrounding them. They have accepted it as a means of survival, but they aren't desensitized to it. They feel it, so the audience feels it. The filmmakers had many opportunities where they could have exploited the blood and violence. Instead, they used it sparingly, strategically. Much of the violence happens out of frame and is sold through context and sound effects, which allows the audience to manufacture far more evocative images than special effects could. The heart of this movie is a touching love story. Josh and Penelope move together seamlessly in the way only a couple that has been together a long time can. They help each other make sense of this world. They are each other's anchors, and they fight to ensure they don't lose a sense of whimsy or the appreciation of beauty wherever it can be found in such a desolate, ugly landscape. They hope to have a child someday, which feels awfully selfish in their environment -' why would anybody want to bring a baby into that world? -' but this is their world, not ours. Simon and Gorsky look hollow yet strong enough to take care of themselves. He is their tactician and muscle; she is their heart and reason for pressing forward to somewhere, anywhere, in the search of a better place to live. This is a dark and dreary world, yet the actors shine through it in an honest way, never grandstanding. You would mistake them as a crusty part of the landscape if not for their persistence and charm. Abira is both instantly likable and suspicious. There are obvious advantages to joining her, but trust is a rare commodity here. The genius of the film is that the audience is allowed the time to ally with Josh and Penelope and their struggle before Abira is introduced, so that we empathize with their curiosity and their caution. In a sense, this becomes the central conflict in the story, and it's handled beautifully. McBride's eyes twinkle with wisdom and sadness, like pools you fear may be too deep. When I imagined myself in their situation, I didn't know whether I would run toward her or away from her. Another of the film's surprises was the photography. Establishing and tracking shots, like a beautifully composed vista, or an intimate, dripping still life, let the crumbling buildings and exposed rebar swallow the characters whole. Trees reached up like dead fingers. Darkened doorways beckoned and warned. This is a beautifully shot film whose images linger long after the lights come up. Review by Colorscheme from the Internet Movie Database.